The Tata Tiago is finally here with its bold new design and brand new diesel and petrol engines. So is it any good? Well, read on to find out. Before we start, let us just wind the clock back a little bit. The day is December 31, 1998, and Tata Motors has just launched the first real Indian-designed and built passenger car, the Indica. And although most people in the country might not really consider it to be an important car, with well over a million units sold in India and across the world, the Indica is definitely a very important car in India’s automotive history. And now, 17 years later, here is another car from the house of Tata Motors. A car that will, in principle, be an erstwhile replacement for the aging Indica. This then is the brand new Tata Tiago. The Tiago really is one of the best looking hatchbacks we have seen in a long time. With a really good balance between a conventional hatchback design like the Alto has, and a tall boy design like the Wagon R, the Tiago’s proportions are quite on point. The grille on this top of the line version is finished in gloss black with great little details like hexagons that get smaller towards the edges. The pulled back headlamps that fuse with the grille too look great and again have a lot of chromed out detail in them which make them look premium. What we also like is the car’s distinct shoulder line that goes all the way from the front of the car, extends just below the windows and all the way to the C pillar. Coming to the rear the inbuilt spoiler with two accent pieces combined with the sporty bumper really ties the car up well and so do the sharp tail lamps. One of the more subtle design features on the car however is the way Tata has stanced the Tiago, especially around the wheels so as not to leave any excessive gaps between the tyres and the bodywork which makes the car look lower and a lot more planted. On the whole then, there is certainly a lot of design effort that has gone into the Tiago and thankfully there is nothing on this car that reminds us of the older Indica the way the Bolt still reminds us of the Vista. Step into the Tiago and you are immediately greeted with a fresh and modern interior that looks as current as anything else in the market today. The dashboard gets a soft touch two tone and uniquely textured interior which when combined with the gloss black centre console looks quite upmarket for a car of this price range. If you opt for the new bright orange or red colors, you also get body colored AC vents on the far side of the dashboard, a feature that just adds a bit of spice to the insides of the Tiago. As an added bonus, Tata has also identified seven individual panels on the interior that can be taken off and painted in any color that the customer wants (at the dealer end) adding a level of customization into the Tiago that is previously unheard of in a car of this category. And even the base model variants will get the gloss black interior accent pieces which will make even the barebones version look presentable. The instrument cluster is festooned in a simple brushed silver color which combined with the crisp readouts make it look quite apt. Coming to the seats, Tata has used an all new black fabric with black and grey inserts on the Tiago. The new seats, especially on the top of the line model look really cool with a wedge shaped top that the headrest fits in and large side bolsters that make it look sporty. Lumbar and back support in general is great but the seat bottoms are not long enough and severely lack under thigh support. The same goes with the rear seats as well. Although there is a great amount of leg space (better than competition like the Maruti Celerio) and the seat does have a good seating angle, the seat bottoms again tend to ruin the experience. Taller passengers might also be slightly inconvenienced by a structural member that does hamper head room a little. And of course, just like the Bolt, the Tiago too does not get a centre arm rest on the rear seats, the omission of which in both cars is just not acceptable in this day and age. Tata has also incorporated a new type of headliner into the car which adds to the premium look. Of course, as expected, you get all the gadgetry like a Bluetooth enabled infotainment system and a USB slot but what you also get (in the top of the line models) is an added feature where through a ‘MapMyIndia’ app on your phone you can display and stream navigation data straight to your central screen. Now although the Tiago does not have a navigation system inbuilt, this feature does essentially double up as a navigation package and works really well. Also, considering the fact that it will support both Android and Apple iOS platforms just gives it a lot more usability. In addition, you also get features like ABS and airbags along with other user friendly features like electronically controlled rear view mirrors, steering mounted audio controls and a height adjustable seat. The Tiago also gets a height adjustable steering column to add to obtaining the perfect driving position. What is missing though, is a touchscreen system like the one in the Renault Kwid and a electronically foldable ORVM. Rear AC vents would also have been a welcome addition but sadly, those are missing too. One of the biggest concerns that we had in the Bolt was the fact that there were not enough cubbyholes and storage spaces. Tata has worked on that and the Tiago gets dedicated slots for bottles, two cup holders and even a separate shelf in the glovebox to store your iPad. The Tiago’s glove box itself is quite spacious and as an added feature on the top of the line version also comes with a cooling option. All in all, the Tiago certainly is well speced in terms of equipment. The Tata Tiago comes with both a petrol and diesel engines that are paired with a five speed manual gearbox. So let’s talk about the petrol first. Essentially, the 1.2-litre engine in the Tiago is a 3-cylinder unit and from the same Revotron family that you get on the Bolt but does not come with a turbocharger. Now, if refinement is what you are after, the petrol engine does disappoint quite a bit. There is a lot engine noise that creeps in especially when pushed hard and in general, it just feels very rough. But, it makes up for it with being raspy and rev happy. Performance isn’t great on paper or on the road (unless revved all the way to the 6000rpm redline) with 85PS and 114Nm of torque, but compared to other 1.2-litre mills in the market (with the exception of the K12 engine in some Maruti products), this one is definitely better. All said and done, Tata should really be addressing the problem of how loud and clattery and almost diesel-like this engine feels. So let’s get to the engine that most people will actually buy. The diesel on the Tiago is a brand new 1.0-litre 3-cylinder engine that makes a modest 70PS of power and 140Nm of torque. Now the trick with this engine, like with every other turbocharged motor is to keep it in the right gear at the right revs. Do so and it will reward you with acceptable performance and drivability. The engine does suffer from turbo lag though especially if you are in a higher gear and lower speeds and this does make overtaking a real task especially if like most Indian drivers, the only thing on your mind is fuel efficiency. On the NVH front though, the diesel is still inherently noisy but is comparable to most of its peers. Now although we have not really tested this engine for fuel economy yet, we expect it to get staggering results both in ARAI test figures and in real life conditions giving it a big advantage over some of its competitors. The Tiago is a real step up when it comes to handling. In fact, after the slightly disappointing engines, we are glad that the boffins at the Tata R&D centre have put in a bit of extra efforts to make the Tiago go around a corner far better than the likes of the Bolt. There is a bit of body roll of course, but on the whole, the Tiago feels very predictable and neutral and really does like to be thrown into a corner and takes the extra abuse without any fuss. The Tiago comes with electronic power steering, and just like the handling, it has been tuned to perform far better than the one on the Bolt even though it is essentially the same hardware. The steering wheel too is really well contoured and the grooves at the 3-o-clock and 9-o-clock position make sure that you have the perfect driving position. Sadly though, the typical customer in this segment will appreciate ride quality a lot more than handling but Tata seems to have that covered too. Take the Tiago over a rough patch or a bump and it reacts quite well and does seem to get very unsettled. At higher speeds too the ride is more than acceptable and there is not much bouncing around when you go over an undulation. Mainly though, the vague feeling that older Indica owners are used to has almost disappeared giving the Tiago a more planted feel. The Tiago gets disc brakes in the front and drum brakes in the rear. The car we drove did have ABS and at first impressions, the Tiago’s brakes did bite well and gave a reassuring feel. On the whole, the chassis of the Tiago is certainly one that deserves praise. 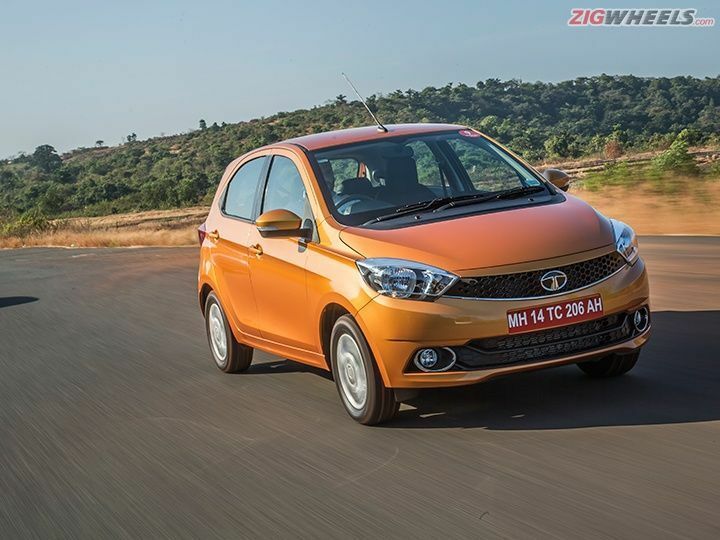 The Tiago is a genuinely good product from Tata motors not because it looks good or handles well or has great interiors, but because it provides a fresh new perspective to the Tata brand in the eyes of the Indian car buyer. Yes, the engines do need a little more refinement and a little more power but if the Tiago delivers best in class fuel economy, we don’t think most Indian customers mind the slightly numb performance. So, would we recommend it? Well let’s just say that if Tata would ever want to resurrect the ‘More Car Per Car’ tagline that it used for the original Indica, the Tiago would certainly be more than worthy.